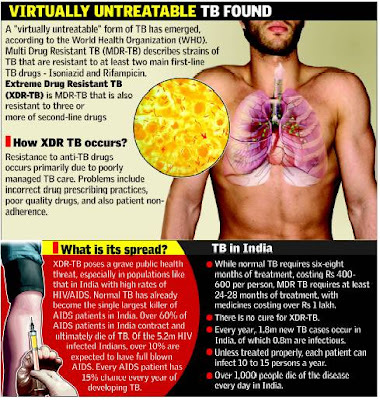 Mumbai: Not just multidrugresistant tuberculosis, its deadlier version- extremely drug-resistant TB could be emerging as one of the most serious health hazards in India, says the first-ever study of its kind conducted by a Mumbai hospital to assess its prevalance. The Hinduja Hospital’s study found that XDR-TB, which is considered a doctor’s nightmare as far as its treatment is concerned, accounts for almost 8 % of the total MDR-TB cases. The finding appears shocking when considered against the US prevalence of 4%. Worse, in India, it seems to be affecting the normal population as against the HIV-positive patients in the West. Hinduja Hospital’s microbiology laboratory, which is a reference lab for many hospitals and smaller diagnostic laboratories in the city, studied 3,904 samples of TB culture throughout 2005. “Of these, 1264 were culture positive for mycobacterium tuberculosis. 409 samples (32.35% of positive cultures) were found to be MDR-TB, out of which 33% (8%) were XDRTB,’’ said the study, which is the first time the deadly disease’s prevalence was tracked in India. 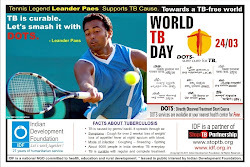 TB has emerged as a public health challenge ever since the emergence of HIV two decades ago. HIV-positive persons with their compromised immune system are highly susceptible to TB. Moreover, with the poor drug-adherence ways of Indian patients, there has been a surge in the multi-drug resistant TB in recent years. The shockingly high prevalance of XDR-TB not only underlines the devastating levels of resistance to drugs among Indians, but also highlights the deadly potential of the TB bacterium. “Even 125 years after Robert Koch isolated the tuberculosis bacteria, we are unable to find an effective way to cure it,’’ says Dr.Udwadia. What a co-incidence of thinking. Like Mahatma Gandhi, the Father of our nation, who was a crusader of leprosy work, his look-alike, Dr. Sharad Nayampally is also a crusader of leprosy work. Dr. Sharad Nayampally who is an international Yoga Therapist and an Alternative Medicine expert having intense knowledge in wheat-grass, accupressure and allied therapy is an Ambassador of Indian Development Foundation (formerly Indian Leprosy Foundation). Keen on doing social work, Dr. Sharad joined IDF to help humanitarian causes in national interest. Retired from the Hindustan Lever Limited, Dr. Sharad has been a great person with a lot of social commitments. Dr. Sharad has directed over 60 dramas and also acted in a couple of movies. I felt bad when i could not get through playing Mahatma Gandhi's role in the famous `Lage Raho Munnabhai', said Dr. Sharad. Quoting Gandhiji's words, `We must be the change we wish to see', Dr. Sharad did a further practice and finally got a entry in to India Today's Ad doing his most endearing role. 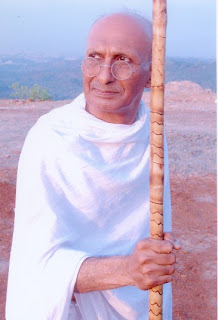 Finally Dr. Sharad got a chance to act the role of Mahatma Gandhi in India Today's ad. 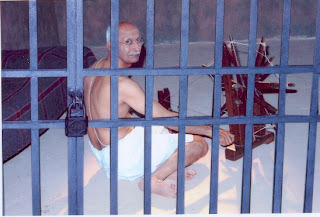 I feel elated and extremely happy to have played the role of Bapuji. It is interesting and revealing. One need to know Bapuji fully before enacting the role. My wish is to visit South Africa and see the work done by our Bapuji. Conducting AIDS awareness programme in rural areas and doing village development work are in the cards, expressed Dr. Sharad. Indian Development Foundation wishes Dr. Sharad Nayampally good luck in his social service assignments. Dr. Sharad is well known as Gandhi of IDF. 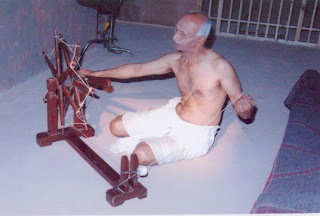 I would like to assure those who would serve Daridranarayana that there is music, art, economy and joy in the spinning wheel. 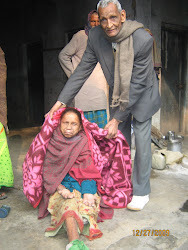 Leprosy work is not merely medical relief, it is transforming frustration in life into joy of dedication, personal ambition into selfless service. 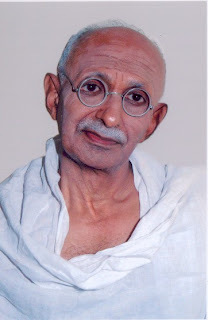 Tension nai leneka, Bapu hai na ! .......Leprosy is a curable disease of the skin and nerves but its victims have long been ostracised by society worldwide. The World Health Organisation says it has been eliminated from 113 of 122 countries where leprosy was considered a public health problem in 1985. For complete story, please click the below given link. IDF is strengthened by getting two more Ambassadors for promoting humanitarian objectives in national interest. Mr. Ashish Taskar who is pursuing his Chemical Engineering from IIT, Mumbai showed interest in social work. `I was very happy to see the Certificate issued by Indian Leprosy Foundation during my school days for participating in leprosy awareness and resource mobilisation programme', Ashish recollected. 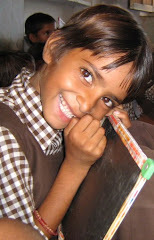 When I came to know that IDF is the new name for ILEF with broader perspectives, I felt very happy and I wish to join as a volunteer and support the poor and underprivileged children, added Ashish. Mr. Nigil Rajan who is currently pursuing his Bachelor of Management Studies from Vivek College in Mumbai also had the same feelings like Ashish. I am currently working for a BPO, but I do feel like associating with social projects during my spare time and feel the satisfaction in life. Nigil too expressed his school days experience and said I was in 6th standard when ILEF had conducted leprosy awareness programmes in our school. Since it was meant only for senior students, I missed the chance of participating. 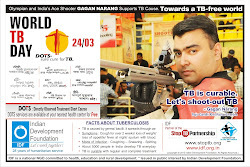 But now I can fulfill my dream of supporting a social organisation like IDF, said Nigil. Dr. Pillai and Dr. Narayan welcomed Ashish and Nigil and inducted them as IDF Ambassadors who will help in promoting the objective of IDF in national interest. Earlier, Mr. Ketan Shah from Insurance Sector and Mr. Anand Swamy from Banking Sector were also inducted as IDF Ambassadors during the month of March 2007. IDF now has 5 national and 3 international Ambassadors. Mr. Karthick S. as the Social Entrepreneur while Mr. Ketan Shah, Mr. Anand Swamy, Mr. Ashish Taskar and Mr. Nigil Rajan are the Ambassadors. IDF welcomes people to join hands in the nation building activity and become Ambassador for Social Causes. You could be the next Ambassador. The first preparatory meeting, orienting the Medical Officers’ of Bellary District on the proposed IEC on leprosy was held in the premises of District T.B. Office in Bangalore on 7th May 2007. The mounting number of leprosy rate had made the health department worried, and the Central Government had taken initiatives to diversify its activities by conducting special district-wise projects in Bellary, Koppal and Chamarajnagar. It was found that, the ratio of leprosy-affected persons have been increasing alarmingly in these districts for last decade. The Central Government in association with Indian Development Foundation (IDF) has planned to conduct district-wise project in these districts from the second week of June 2007. Dr. R.V. Hanumiah, the District Health Officer presided over the meeting. Speaking on the occasion, he emphasized the whole-hearted involvement of the medical officers in the campaign. He appreciated the District Leprosy Officer Dr. H.M. Rajashekar and Indian Development Foundation for the initiatives taken towards mobilizing local resources to carry on the massive campaign. Dr. H.M. Rajashekar, the District Leprosy Officer, explained the role of Anganwadi workers, Supervisors, Medical Officers and the Non-Medical Supervisors in the IE C campaign. Dr. S. Franklin, Manager for Indian Development Foundation, Karnataka region mentioned that the programme was an excellent example for Government, NGO and public participation and recorded his appreciations to Dr. Neela Biradar, Joint Director of Leprosy and Dr. R.V. Hanumiah, the District Health Officer for the valuable guidance and support. Dr. Nizamuddin, the District T.B. Officer, Dr. Ramesh, the District Surveillance Officer, Dr. (Mrs.) Hanumiah, District Family Welfare Officer and Dr. R. Abdulla District Reproductive and Child Health Officer participated in the meeting. Around 60 medical officers representing all the Primary Health Centres in the district attended. Mr. K. Mallappa, Para-Medical Worker, D.L.O’s office proposed vote of thanks. Hold SHIFT KEY and CLICK on the link. About 125 years ago, a virtually unknown German country doctor called Robert Koch stood before the Physiological Society of Berlin and announced that he had discovered the cause of tuberculosis. This was probably the most astonishing and significant statement in the history of medicine. Yet, the disease he discovered still kills 1-2 million people a year and new strains of the TB bacillus threaten to undo the progress of 125 years.